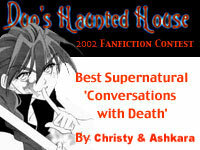 Ashkara and Christy are working together while Mel is in Japan. This is the result. 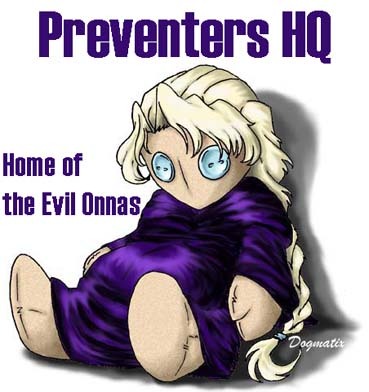 Welcome to the home of 'Evil Onnas Inc.' For more of Ashkara's great fics, visit 'Ashkara's Fanfiction Vault'! Call Me A Fool Songfic. Heero POV, sap, angst, AU, 1x2pairing. 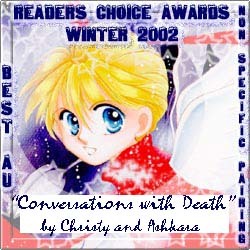 Companion fic to 'Alarums and Excursions'. However, it can be read on its own. Duo's childhood and training seen from a very unique perspective. 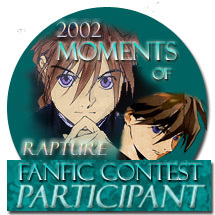 Written for the 2002 Moments of Rapture Contest. POV, 1x2, AU, sap. Overreacting Side-fic to 'Changing Allegiance'. Where Treize Went Wrong 13x5, 13x6, 13x5x6 and vague mentions of others. Treize gets an email from one of the pilots, and his reply will have you in stitches!